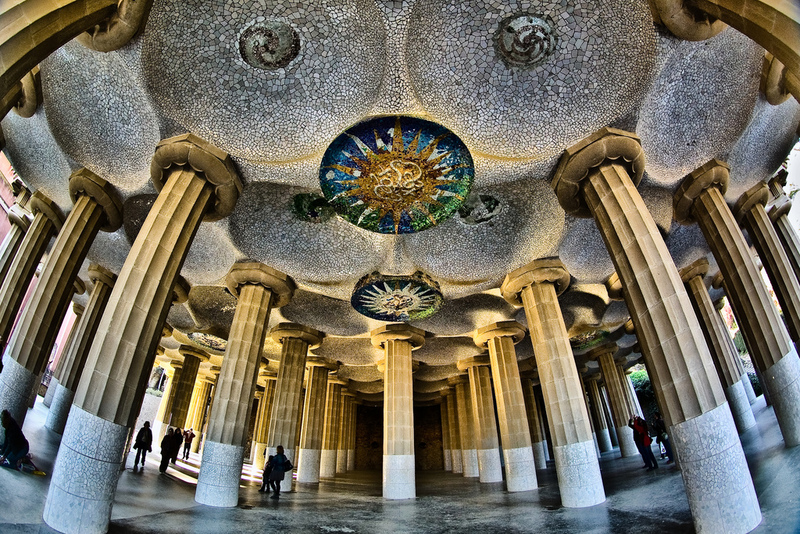 Antoni Gaudi, the designer of Park Guell is an enigma that much is clear. They say that when he graduated from University, upon awarding him his degree, his teacher said that he was not sure if he was giving the degree to a genius or a madman. Today, Gaudi is up for sainthood. He also enjoyed the local mushrooms for tea. This park is a favorite stop for visitors and families to Barcelona. Originally commissioned by Eusebi Güell, a friend of Gaudi’s, Park Guell was to be a wealthy housing development with 60 housing plots, magnificent views and gardens, alas the park did not catch on. Fourteen years into the project, it was abandoned and in 1922 the city of Barcelona opened it up to the public. 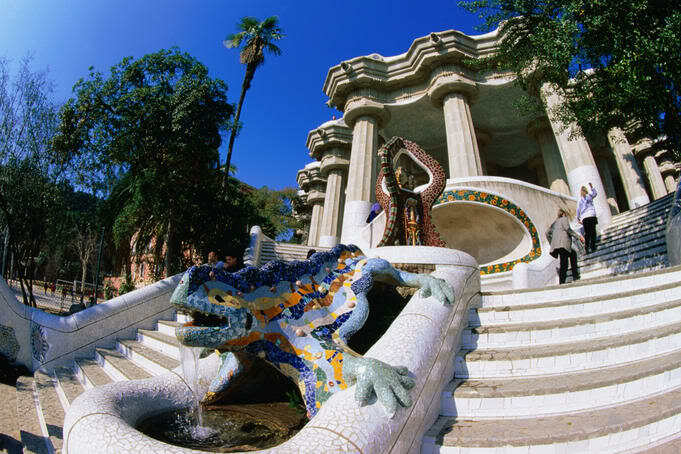 Today Park Guell is a UNESCO World Heritage Site. Once past the entrance way and after you have greeted the beautiful mosaic dragon, it’s up the steps to the Sala Hipóstila. This area has 88 Doric columns and was inspired by the Temple of Apollo at Delphi which intrigued both Guell and Gaudi. Nature was another inspiration for Gaudi who said that his favorite “book” on architecture was the tree. Further up the park, people love to get their picture taken on the long serpentine like mosaic bench which surrounds the Gran Placa Circular, an area that was originally intended as a market square. This colorful, picturesque attraction makes a great photo, and is fun for instagram fans. The view from here is good too. The best view will be found at the very top of the park where the chapel was planned to be. From that lofty point you can see all of Barcelona, out to the sea and landmarks like Camp Nou and Sagrada Familia. 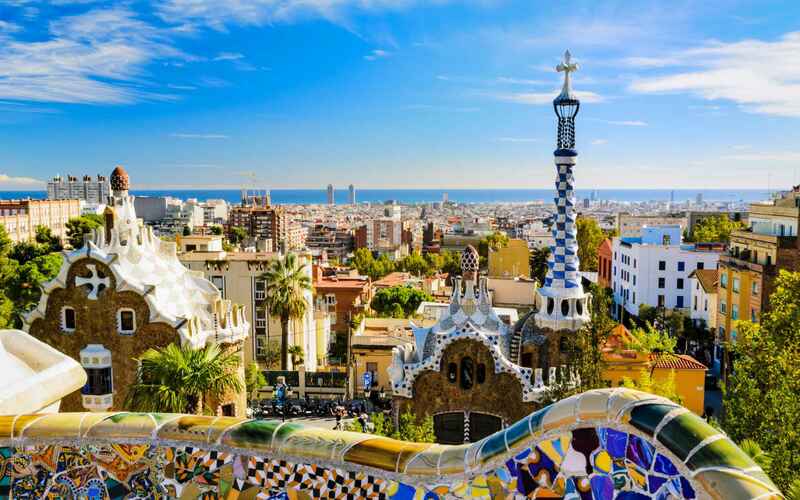 Park Guell is located in a beautiful natural setting with gardens, pathways and views. Recommended on your visit to Park Guell is the tour of Gaudi’s house, which oddly was not designed by Gaudi, but is interesting to see. 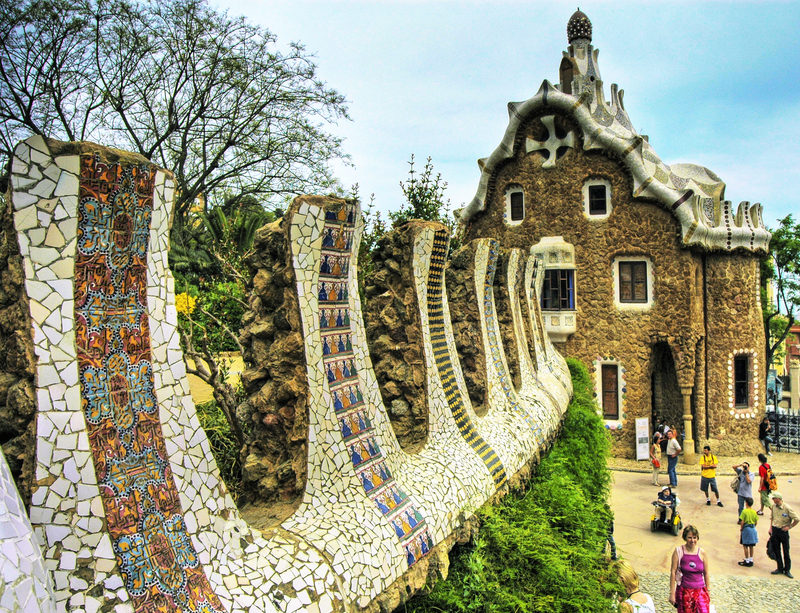 Children love the colorful, playful feel of Park Guell too. It is a good idea to buy your tickets ahead of time to avoid the lines at the park. It is a bit of a climb to get here, but this is a city park that you will not easily forget. Have a great saty in our aparthotel for family in Gracia!